We’re appreciative to be honored for our Unreal Engine 4 animated short film, A Boy and His Kite. 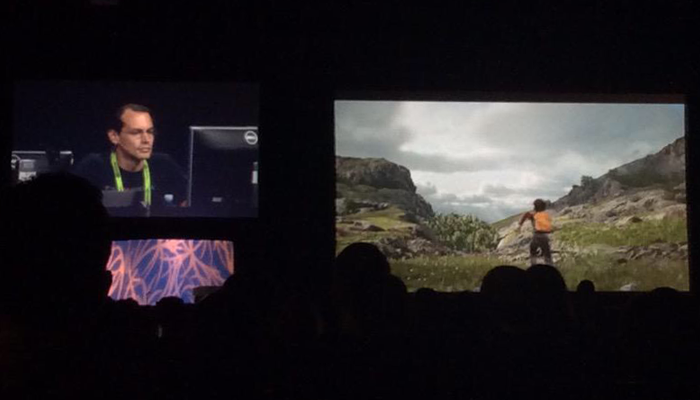 At SIGGRAPH 2015 lead rendering engineer Nick Penwarden presented the cinematic during Real-Time Live!, and then accepted the Computer Animation Festival award for Best Real-Time Graphics and Interactivity on behalf of our team. Epic built a demo to showcase UE4's open world features and rendering capabilities in time for GDC 2015. The A Boy and His Kite cinematic holds practical value in that it highlights varying topography across the demo's 100-square-mile landscape, yet it also conveys a story with genuine heart and emotion. See it for yourself in the video below. Keep scrolling to learn about interesting ways the content - available for free through the Epic Games launcher - can be used, and to read about unexpected stops it's making on the film festival circuit. The open world demo upon which the cinematic is based helps developers take advantage of the Unreal Engine's photoreal capabilities and support for massive environments. Realistic landscape springs to life with dynamic direct and indirect illumination, cinematic depth of field, high-quality motion blur and procedurally placed trees and foliage, all rendered in real time. For more details on the sheer scope and size of this release, head over to the Unreal Engine 4.8 release notes. We're honored to receive the award for best interactive real-time experience for A Boy and His Kite at #SIGGRAPH2015. Thank you, @siggraph! At SIGGRAPH we announced with Faceware Technologies and Opaque Multimedia the UE4 plugin for Faceware Live. The folks from Faceware spent a few days with us just before the show, and in the video below you can see early results of their markerless facial capture solution high-fiving with UE4. A Boy and His Kite also appeared in the SIGGRAPH Electronic Theater and the Electronic Theater Daily Selects. Only two of the 133 films at the show were screened in both. As hinted above, Kite is making the rounds at animation and film festivals. Here are a few stops - past, present and future. We're inspired by the possibilities at hand with the convergence of film and games. A Boy and His Kite is proof that characters and worlds rendered in real time can stand out amongst live action and prerendered performances. Take the Sploid Short Film Festival, for example: There are five official selections, and four of them feature real life humans and cameras. One was created by a small team of people who make games. Filmmaking - and, by extension, new media, including virtual reality - is on the cusp of a revolution. Through available tools and content, not to mention what's on our roadmap (cough, Sequencer), developers have unfettered access to technology that is setting into motion a sea change. If you have a dream that can be realized in real-time 3D, you can use Unreal Engine to get there. In stunning detail and quality, for free. Please sound off with any feedback or questions in the comments section. We'd be happy to hear from you, and we'd love to see what you're creating with Unreal.